What is My Host Pin? Can I have a Co-Host on my show? Can I change the volume of the audio files while I am on-air? Do I have to stay on the host line for the entire show? I have a pre-recorded show, may I set it to play automatically? Attend our free educational series for hosts covering marketing, producing, technology and general Q&A. Create a live talk radio show with up to 3 hours of air time per day. Enhance your show with custom sound effects or music. You could even upload a pre-recorded interview or a spot promoting your next show. Your imagination is the limit. Tap into your social network to tell more people about your show. We've built in tools for sharing your show on Facebook and Twitter so you can post updates live. Take callers into a private screening room before you bring them on the air so you can get their name or question. Or you can talk to a co-host about the next segment while music's playing. Interact with your listeners in a live chat room. This adds a whole new interactive dimension to your broadcasts. Connect to your show directly from your computer without a phone by using Skype. Our Studio features a sleek design, intuitive switchboard, and integrated promotional tools, making it easy to produce and promote your shows. The Studio provides you with a robust way to manage and produce your show content with features such as integrated chat and the ability to upload audio clips directly to the Studio for on-demand use during the show. 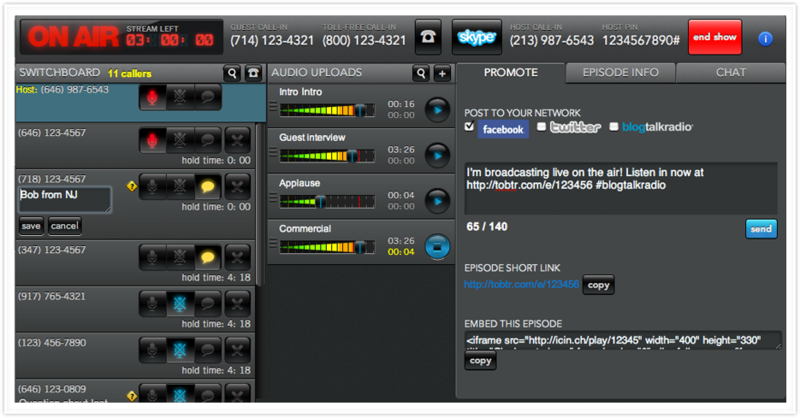 The Studio functionality simplifies distribution and promotion for your shows and creates an opportunity to attract listener traffic and engagement via social media with new features such as one-touch sharable updates to Twitter, Facebook and the BlogTalkRadio website and pre-populated Tweets announcing when a show is live that adhere to the 140 character limit and link directly to the show. If you have additional questions or would like to provide us with feedback, please feel free to Contact us. We'd love to hear from you.